Mark Sparks‘ musical journey has included stops in many places. In a career that began at the bottom of the orchestral ladder (his words), he advanced by way of the orchestral audition process to his current post as Associate Principal Flute of the Baltimore Symphony Orchestra (Update: Now Principal Flute of the St. Louis Symphony). Born in Baltimore, he spent his early years in Cleveland Heights, Ohio where, along with his two brothers, he began piano, ballet, and music theory instruction at the Cleveland Institute of Music Preparatory Department. 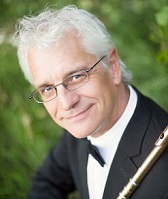 Switching to the flute, Mark’s first teacher was Hungarian flutist Joseph Juhos (Mark can still hear his thick accent, “Mark, you vill be great zolo fluteest.”) With his father, a biomedical engineer and talented choral tenor, he attended Robert Shaw concerts in Cleveland, Ohio at an early age. In 1972, the family moved to St. Louis, Missouri where Mark continued his studies with flutists of the St. Louis Symphony Orchestra. I’ll pick up the interview here. Mark Sparks: St. Louis is where my real path with the flute began. Performing with my teachers now as acting principal flute in the St. Louis Symphony is a complete thrill. Don Bailey: Isn’t it interesting how you’ve ended up playing with the orchestras of both of your childhood cities? Yes it is. Actually, my mother’s family goes back to the 1860’s in Baltimore. When did you know you would have a career in flute? Well, my first career goal was actually to play professional football! I was on the junior high school football teams growing up and continued into high school. And you played the flute the entire time? Not really. What happened though, was that the other football players were getting so big that I got injured every time I played. Sensing that I might relate better to a male teacher, Janice Smith, Assistant Principal of the SLS and my flute teacher at the time, sent me to Jan Gippo, who is the Piccoloist in St. Louis. Jan is on our concert series this year, too. Yes, I know! Jan became a mentor to me. He introduced me to some of the French pieces that were technically challenging, and I was enthralled and began playing flute a lot more. He was a demanding, but very inspiring teacher. Did you continue with Jan through high school? Yes, until my senior year, when I took lessons with Jacob Berg – former principal in the SLS. Jake was also a wonderful teacher and helped me develop artistically. Both of these guys were, and in many ways, still are my heroes. I assume you never played in a marching band because of the football conflict? As I recall, Jan forbade me to play in the band. I think he felt piccolo at that stage would be bad for my embouchure. Was it Jacob Berg who influenced your decision to attend Oberlin? Yes, it was Jake who told me about Robert Willoughby. What were your lessons with Willoughby like at Oberlin? A disaster at first! He and I joke about this now, but I was an extremely stubborn student, and I think my first year there was very frustrating for him. He threatened me with expulsion at the end of the year, which I probably deserved. Stubborn in the sense that you had your own way of doing things? Exactly. Bob wanted to open my mind and show me new possibilities with the flute, but I was loath to let go of some of the stylistic traits that I had developed. To this day, I’m still hardheaded at times and like to do things my own way. Amazingly, no. The turning point was when Bob recorded my playing and had me listen to myself. I had to face the fact that I didn’t sound the way I thought I did. He pointed out things that I needed to change in order to grow, and he was RIGHT! From that moment on I realized what a compassionate teacher and open-minded person he was. I finished my degree at Oberlin with him. What was your course of study – etudes, solos, orchestral repertoire? Bob’s style was to require that you accomplish certain fundamentals: tone production, breathing, study of vibrato, and certainly plenty of scales and etudes – mainly the Andersens, but also the Karg-Elert Caprices and the basic repertoire. As long as you developed these areas, you could go pretty much anywhere you wanted. Looking back, I think the most important thing I learned from Willoughby was that I had the ability to think my way through fundamentals. Bob had a unique, crystal clear way of guiding you through a phrase. Did Mr. Willoughby encourage you to pursue an orchestral career, or was this your own idea? I had actually decided I wanted to play flute in an orchestra when I was 15. As Jan Gippo’s student I was required to listen to pieces and write reports on them. As a result I learned a large amount of mainstream orchestral repertoire and fell in love with it. After you graduated from Oberlin, what did you do next? Well, soon afterward a friend mentioned an opening in the Caracas, Venezuela Symphony, so I hurried to New York that same week and won the audition. I had only a few days to pack and move to Caracas, where I stayed for almost a year until I won the principal flute spot in the Canton [Ohio] Symphony. Did you find your self-confessed “stubbornness” from your student years a hindrance in the orchestra? It’s interesting, I found that although I applied my stubbornness to my own standards, I really did have the ability to be flexible and work with others. I had very good training in my high school orchestra, and especially in the SLS Youth Orchestra, but I admit that playing in a professional orchestra proved to be a different thing altogether. I had to learn many things on my own and was thankful for Willoughby’s training in this area. I worked a lot with a tape recorder, listening carefully, asking myself a lot of hard questions about my playing. Ah, the tape recorder thing…. it’s like a picture’s being worth a thousand words. Absolutely. I think if you do it for enough years, you begin to know what you really sound like. Mark, students today don’t want to wait years, they want to win on the first audition! Well, (laughing) all anyone has to do is look at my career and see that you can start from the bottom and gradually learn as you go. Some players are fortunate, they start at the top and stay there. Yours is certainly a more realistic and common path. I think students can relate to my career. I started by taking small auditions for small jobs. For me the audition process has been a way of getting to know my playing and develop my ideas. When you were taking these small auditions, did you have the opportunity to take major ones, too? Yes, there were some. I auditioned for the Pittsburgh Symphony when I was still a student. That was a valuable learning experience. Did I honestly think I was going to get the job? I don’t think so. I knew that I wasn’t ready for it, and obviously the committee agreed. I find the various paths flutists take interesting. There are so few jobs, the smaller ones don’t pay very well, then on top of that there are so many applicants for all of them. It seems inevitable that one would continually move upward from job to job. Yes, if one has the determination, that is. I was intent on working my way up the ladder to better orchestras, improving not only my salary but also my playing along the way. After a year in Memphis, I won the principal flute position in San Antonio and stayed there for a couple of years before moving to Baltimore. You have a position in Baltimore, yet you’re playing currently in St. Louis? What’s this about? Yes, I’ve been the Associate Principal Flutist in Baltimore for 13 seasons now. But when Jacob Berg announced his retirement in St. Louis, I was asked to be his replacement during this time until they fill the vacancy. I was able to take some time off from Baltimore to play here until mid-November. Through the NY grapevine, I heard that you were being considered for the principal flute spot in the NY Philharmonic. What’s the story with that? Well yes, I was a finalist for that position, as well as for the Chicago Symphony, but I really can’t elaborate further at this time. Do you think you’re successful in your auditions because you’ve learned from so many of them, or do you think there just comes a time in one’s life when you’re seasoned enough to start winning? Definitely I have learned from them. When taking auditions, I set two goals: mastering the fundamentals of flute playing, and developing a system of practicing the repertoire so that I become musically and emotionally free in the audition environment. And yes, some seasoning matters here. Do you insist on perfection, or do you make allowances for just being human? I don’t really focus on playing excerpts perfectly or not perfectly. Mostly, I compete with myself to try to play my best. Also, I try to achieve consistency so that on the day of the audition I have confidence that all of the elements involved in my presentation will come together. How do you personally prepare for an audition? I start one month before and practice as many hours as possible, concentrating on fundamentals first. With every excerpt, I start with rhythm, which establishes a framework in which to develop all of my other thinking. Rhythmic mastery is the basic key to being able to play well in an orchestra. I start with a metronome, and if the piece is technical I start slow to fast, organizing and grouping the notes where necessary. I also reconsider interpretation and concepts; old ways of playing an excerpt may give way to a new approach. Then I will address another element, such as tone. Am I producing the tone that I want on every note? A tape recorder is the most efficient way to improve all these elements. I often use the tape recorder as an audience or an audition committee; repeating the excerpt a number of times to build consistency. Whereas in a recital setting I allow for spontaneous feelings and ideas, in an audition setting I put every note under a microscope. Then, on the day of the audition I am finally able to show the results of all my work. This is the time to have fun!. Okay, now you’ve won the audition. What are some of the difficulties of playing in an orchestra? Well, intonation is certainly a wildcard. (Laughing) Your aforementioned stubbornness comes to mind now. Do you expect others in the orchestra to match YOUR pitch? Ha, I like to think that I’m pretty flexible. Certainly, playing in tune with one’s self is the place to start. Does intonation tend to take care of itself as you move to better orchestras? Well, I don’t think it ever takes care of itself really, but perhaps in the better orchestras intonation might be less of an issue. How would you compare playing in tune with piano to playing in an orchestra? It’s easier to play with piano because it’s a consistent medium, and you’re dealing with only one other artist/collaborator. One just needs to be at all times aware of the scale of the piano. The orchestra, on the other hand, is a constantly fluid medium, and one has to be very sensitive to pitch differences with other instruments and be able to quickly perceive what’s high, or a little low. For example, there will be passages where distinctions have to be made between like pitches. You may have played an F natural in one bar, and because of the chord structure or the other instruments involved you had to influence it a certain way. In the next bar, however, you might play the same F natural, but its context may have changed and you will have to play it differently. In addition, when we play with the strings, we have to influence pitch in certain ways, and certainly if you’re playing the third of a major chord, you have to play it lower…but then, not every time! There will always be extenuating circumstances to keep you on your toes. Playing in tune with yourself is the beginning. Tell us about your summer musical activities growing up. I know how important these are for all of us in terms of shaping our goals. I attended a small festival in Nebraska, which is not in existence any more, called Festival of a Thousand Oaks. It was there that I met Ransom Wilson, who was and still is a great inspiration to me. Ransom was very generous with his time and gave me many lessons. I later went to NY to take more lessons with him. When I returned to Oberlin, Willoughby was thrilled at the progress I had made with Ransom. Another summer I spent with the National Repertory Orchestra which was also a great experience. And later, after I had left Oberlin, I attended Aspen and Tanglewood. I studied with Nadine Asin in Aspen just before I moved to Memphis in 1984. Nadine, who is now one of my colleagues there, was a fantastic teacher and my first experience studying with a dyed-in-the-wool student of Julius Baker! I’m constantly reminded how small our flute world is. I interviewed Nadine last year, and we talked a bit about you; now we’re remembering similar experiences you and I both had with her in Aspen. Yes, it is a small world. When I was student there, Nadine was particularly inspiring in her playing in the Aspen Chamber Symphony, which was, and still is a high level ensemble. I was delighted when they invited me to join the faculty as principal flutist in that orchestra. Aspen is one of the great joys of my life. Let’s talk a bit about your teaching at the Peabody Conservatory. Do you have a set curriculum for your students? I try to take into account what each individual may need and tailor the curriculum to the student. However, we do have a heavy orchestral emphasis at Peabody, and my opinion is that if students want to participate in the audition process, they should start refining the many factors of auditioning while still in school. I teach a rigorous and demanding class in orchestral auditioning. How do you teach your students to prepare for an audition? I encourage them to make every excerpt a personal statement that expresses everything they feel about the character of that part of the piece. Achieving that goal makes for a successful audition. Add a little bit of luck to this mixture, and then it’s possible to win. Each student must develop his or her own routine, but again, the fundamentals are the place to start. Do you require your students to participate in competitions around the country? I encourage them to, yes, but this may be an area of instruction that I want to emphasize more. May we talk about your CD recording experience? The Newsletter focused on this issue last year and the readers seemed to enjoy hearing about it. I’ve only done one recording. There was time pressure, and there were times when I wondered why I was doing it, but in retrospect, it was an intense learning experience. It allowed me in the end to really discover some things about myself and my playing, which I don’t think I would have learned any other way. Update: Mark has since recorded 2 cd’s, one entitled “fantasie”, released on AAM Records in 2010 and currently available on cd sites and select retailers, and a French album, to be released in 2012. Your recording has an interesting collection of pieces – some which are rarely, if ever, performed. The Casella Barcarole and Scherzo is in my own repertoire, and I find many flutists aren’t aware of it. I just wanted to record beautiful music that I thought people would be interested in, works that aren’t well known or that may be infrequently recorded, and pieces that students might be learning. Did you record in several sessions, or in a concert setting? We used a small concert hall and recorded in sessions over three days, although the last day was about a month after the first two. My recording engineer, Ed Kelly, has a fine reputation throughout the country, and his positive attitude, flexibility, and knowledge of the process made the whole experience a positive one for me. I suggest working closely with the recording engineer during the editing phase so that the final decisions are your own. I agree. I came away from my project with much improved listening skills, just due to the editing process. Did you feel this? Oh yes, it definitely requires a knowledge of the score and an awareness of your own sound. Think you’ll make another CD? Yes, I’ve scheduled some recording sessions in December for more of the same type of repertoire. Mark, if you’ll allow me to switch gears here….may I ask about your personal life? Absolutely, and I was hoping you’d ask because I have a remarkable family. My wife Dee is a highly successful freelance violist in Baltimore and former classmate at Oberlin. My son Luke is 7, and my daughter Tory is 4, and they remind me every day what is really important in this life. My family is so supportive; I can hardly express what an inspiration they are to me. Dee has stood by me during my struggles for so many years. Her ability to understand what I’m doing and why I’m doing it has been remarkable. Update: Mark and Dee divorced in 2007. Tory is 16, a harpist and Junior in High School, and Luke is 19, having just completed his Freshman year at Indiana University in Bloomington. Mark lives with his fiancee, Bulgarian cellist Valentina Takova, in St. Louis’ historic Benton Park area. (laughing) Because I still love music as much, and more, than when I started out. I like to think of myself as a musician first and a flutist second. No, I am not burned out. I do get tired sometimes, though. I have a very heavy schedule many weeks of the year, and now it continues on into the summers with Aspen and other festivals. But the music and my students are constantly energizing me. Where would you like to end up? What’s the last stop on this path of yours? Frankly, I try not to think in those terms. But you’re obviously driven to keep going to a higher level, yes? Well, it’s true that I would like to be principal flute of an orchestra, but at the same time I realize that I’ve been incredibly fortunate, and I’m always inspired by the many projects I have going. Yes. One thing I’ve rediscovered here in my thirties is mountain biking. That athletic bent that I had in my teens is still there, and I’ve always loved bicycles. I’ve been biking for 6 or 7 years now. Having another activity that requires intense focus is very important because I’m able to free my mind from the music world for a short time. Then, when I come back I’m refreshed. You know, the flute is a very physically demanding instrument. When we play the flute, we are athletes, and my schedule demands that I play a lot. I feel if I can keep my body in good condition, then maybe my career will last a little longer. Before we stop, do have any comments to other performers about nerves? I think nerves are very personal. We become nervous for all kinds of different reasons, and what is going to help one person may not help another. Confidence, though, is very important. That may be the real answer. What happens to you as you sit waiting for a big flute solo in the orchestra? Anything? Well, I’m just always very excited to play, and in a way that has been my cure for nervous jitters. I feel that playing in general, the act of communicating musically through the flute, has a great deal to do with the way I feel about things in terms of my soul. I’m very thankful for my career. If it were to stop today, I would feel satisfied with the whole thing. Thank you, Mark, and let’s hope your career doesn’t stop just yet. First the jock, then the musician/flutist…..now you speak as a poet. I’m looking forward to your concert on November 21st.